Every Sigma box / Sigma key owner can activate Pack 2 and get access to this particular and future features, that will be introduced in this Pack. After the check has been completed and program says: “Verifying ... You should activate required PACK to work with this model” – this message means that your phone’s firmware version is supported by our solution. Sigma Pack 2 is constantly evolving and being updated, so stay tuned! 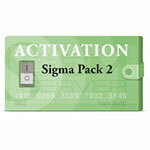 Please Note: This particular Activation Pack 2 can be used with Sigmakey Dongle or Sigmakey Box only.